Discover Niagara’s best seasonal wine events. Don’t miss out on all of the incredible experiences that the Niagara wine region has to offer this summer. Whether you embark on a guided Niagara Wine Tour, book the Ultimate Niagara Winery Experience Package, or reserve tickets for any of these amazing events, Niagara has wine experiences for everyone to enjoy. Visit the sprawling vineyards and beautiful winery of Chateau des Charmes for a relaxing Sunday Wine Down event. Taking place over three Sundays in summer, this dog-friendly event allows visitors to enjoy live music, wines by the glass or bottle, weekly wine cocktails, wine popsicles, and cheese and charcuterie. Unwind in wine country and head to Chateau des Charmes for the remaining two dates of this great event, on August 26th and September 30th, 2018. Bring your own lawn chair or blanket and spend the day in a picturesque vineyard listening to the blues! Tickets include entrance to the event and a souvenir event glass. On August 17th, 2018 13th Street Winery will be hosting the 15th annual Mayor’s Au Marché event in support of the Investing in St. Catharines Youth Fund, which helps young people in financial need participate in the recreational and cultural life of the city. 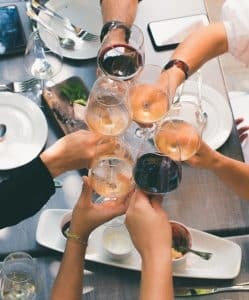 At this event, guests can enjoy samples from local Niagara wineries and craft breweries, an array of food from local restaurants, and live music from local entertainers. The remarkable Niagara wine region is waiting to be explored this summer! Book your tickets now for these one-of-a-kind events and discover everything that this world-renowned destination has to offer. Sip and savour the very best of Niagara at the Grape & Wine Festival’s Montebello Park Experience!